SAS Sergeant Geordie Sharp is required to undertake two top-secret missions, in the full knowledge that, if things go wrong, the authorities will deny all involvement. In the first mission he is to serve as a commander of a hit team on a Black, or 100 per cent non-attributable operation assigned to the SAW, the Regiment's ultra-secret Subversive Action Wing. His target is an Iraqi who defected to Libya after the Gulf War. The aim is to kill him and leave no clue to the identity or origin of the assassins. Returning to base, Sharp finds he must also carry out a high-level political assassination on mainland Britain. If he fails, his four-year-old son will die at the hands of the IRA. Trapped between opposing forces in a fight to the death, he twists and turns through a maze of nightmare options, desperately seeking some way of averting tragedy. Who will be hit the hardest - Geordie Sharp or the British government? 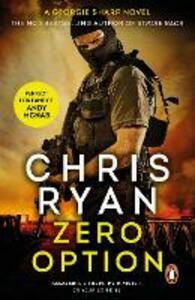 Another non-stop pulse-pounding thriller from the established master of the military fiction genre.